When the cold winds rise and the dark clouds drop, hundreds of faithful devotees will flock to the beacon of light shining ever so brightly in the heart of none other than Bankstown. My dear friends, I bequeath onto you Sydney’s worst kept secret for the best bowl of beef noodle soup: Pho An Restaurant. Believe me when I say, there truly is no snuggie or cup of tea that can satisfy your comfort cravings on a bitterly gloomy day other than an un-pho-gettable steaming hot bowl of pho that seemingly flies out of the kitchen and onto your table in no less than five minutes from the time you order. This is the mantra many chant quietly in their head while waiting in line and more often than not, in the rain. Of the many years I have eaten at Pho An Restaurant, I have always seen a line out the door. More so than any given day, the line will be significantly longer when it is raining and for good reason. But firstly, what is pho you ask? 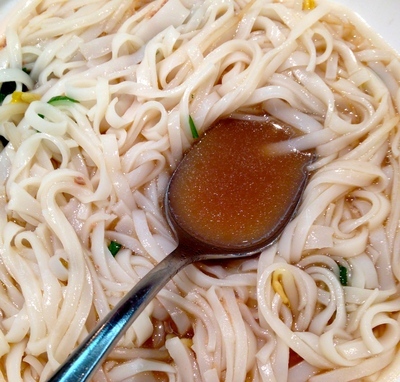 You may have seen the word or heard your friends order ‘fur’ at a restaurant and discover that it is in fact a beef noodle soup rather than the wolf pelt you were expecting to see. As Vietnam’s national dish and my personal favourite, pho is a beef noodle soup topped with slivers of raw and cooked beef, bean sprouts, basil and optional lemon. So what’s all the hype about then? Let me first begin with the most important feature of this dish: the soup. Before your tastebuds even start singing, the smell of pho will delight just about every inch of your brain. The heavenly scent of pho is warming, cinnamony, rich and savoury. From about this moment onwards your mouth will start salivating and your spoon will be flooding with the golden liquid already on its way to your lips. From here on out, there is nothing in the world but you and your bowl of pho. The world goes quiet, you see nothing but silky rice noodles entwining around your chopsticks and the dance between the thin meaty strips of beef and hearty soup in your mouth just make you want to cry. This is my friends, is why the line is almost always out the door on a rainy day. While I have eaten pho from this restaurant since I can remember, I’ve always noticed how personal it can be. It’s all about personal preference in taste and flavour. I love spritzing my pho with lemon wedges, having my bean sprouts cooked (an option available if you ask when ordering), piling on the fresh basil and dipping my beef in the petri dish like saucers of the home made chilli oil. I know others prefer dousing their soup with fish sauces, adding enough explosive chilli to fire a gun and no lemon. Absolutely no lemon. 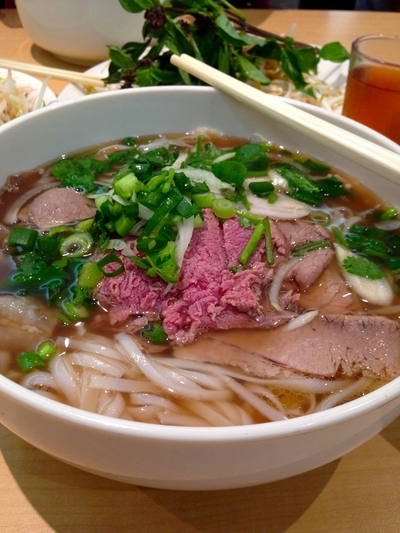 To each their own, pho is a dish you can build up or leave simple depending on what you like. There isn’t anything cute about being shy in a place like this. Sharing tables, tissue boxes and chopstick bins with your neighbours is commonplace. When you’ve got such an incredible dish in front of you, you don’t even notice the baby in the high chair next to you watching with curious eyes as your face goes into a state of ecstasy. While there is often a line out the door to get in, fear not. It goes quickly and you will be with your beloved pho in a matter of minutes after joining the end of what looks like the longest conga line you’ve seen in a while. Service is incredibly efficient, and a few times I’ve had my pho arrive before even a pot of tea and cups have arrived at my table. The amount of staff on the floor always ensures that you are seen as soon as your head peeks up from your bowl, should you need any assistance sobering up from your exasperatingly delicious ordeal. When you’ve got 200 people in a restaurant ordering the same dish, don’t be a fool and ask for a menu. Do as the locals do and say "I’ll have what she’s having." Why: For the most comforting meal on a cold rainy day. 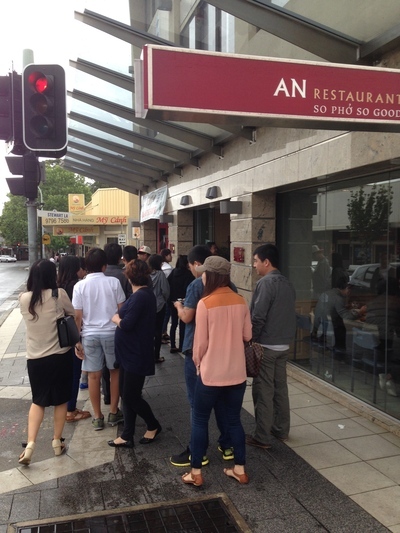 When: Perfect for lunch but expect a wait. Dinner is much quieter. Take away: Yes, but it doesn't feel the same as eating it in.